Total surprise! I did not leave the theater angry at having wasted another two hours of my life. The Hangover Part III actually has a story, a new story, a different story, something as far away from the first two films as you can get. The main plot of The Hangover Part III (and you may be left wondering how the title even makes sense since no one ever actually gets drunk and blacks out during the course of the film … but there is an answer) starts with an intervention on Alan's (Zach Galifianakis) behalf. He's been off his meds for six months, he bought a pet giraffe because he could (and then accidentally decapitates it on the drive home), and has a fight with his beloved father who dies from a heart attack as a result. Alan's family and friends, The Wolfpack, gather to make him an offer he can't refuse, and the guys – Phil (Bradley Cooper), Stu (Ed Helms) and Doug (Justin Bartha) – go on a road trip with Alan to the rehab center. On the way, their van is run off the road, they are all abducted and brought to a man named Marshall (John Goodman), a character who was mentioned once by "Black Doug" (Mike Epps) in the original movie. It seems that Mr. Chow (Ken Jeong) stole over $20 million in gold bars from Marshall (and clever flashbacks to the first two films help set this plot up) and he wants Chow and the gold, and he thinks the guys are the only key to contacting Chow, who had escaped from a Thai prison in the film's pre-title sequence. It seems that Alan has been a pen pal with Chow while he was in prison, and Chow has emailed him to set up a meeting. Marshall wants the guys to bring Chow to him and he'll be keeping Doug – yes, he's left out of the main action again – as collateral. 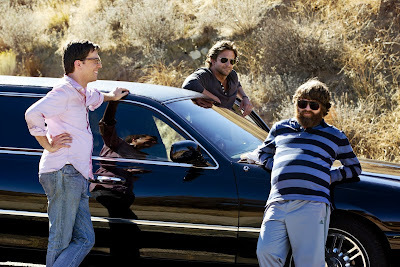 The Hangover Part III really works this time – and seems to be getting a raft of negative reviews – because the story drops the whole blackout gimmick and becomes more of a darkly comic action flick. I found the Wolfpack characters to be extremely unlikable in the previous films, but this time they've been softened and humanized just a bit to give the audience characters to engage with and root for, a key element for any movie. The adventure they are drawn into, and the clever plot twists and turns along the way as you never know if Chow and Marshall are being up front with the Wolfpack, really made this an entertaining ride. I appreciated the intricacies of the plot and the clever way characters from the past films – Black Doug, Jade (Heather Graham), "Carlos" (Grant Holmquist, the same baby from the first film!) – have been incorporated into the story. It's these callbacks that really bring the series full circle and give it a very satisfactory ending. Melissa McCarthy also pops up in a pivotal role that gives meaning to the film's title in a brief post-credit segment (so don't leave as soon as the credits start rolling). As much as I disliked the first two Hangover films, I have to give credit to Todd Phillips for having the balls to really take the story in a different direction, and for the actors and studio willing to go along for the ride. The addition of John Goodman gives the film a bit more respect, in my book, and adding some depth to the Chow character even makes Jeong's performance more bearable. Overall, The Hangover Part III succeeds because it is a different situation with established characters that keeps the puzzle formula of the series intact, but putting the pieces together requires a little more ingenuity. It will be interesting to see how the series' fans take to the new approach but, for me, The Hangover Part III is by far the best in the series.